Called "ImmuNet," details of the publically available resource were recently published online. The tool uses information compiled from 38,088 public experiments to predict new immune pathway interactions, mechanisms, and disease-associated genes. With advances in inexpensive computing power, and stored data collections becoming massive in the era of "big data," researchers are now able to combine algorithms and models into tools like ImmuNet that pull previously unrecognized disease patterns from databases. These computational patterns are predictive, and researchers can test them with further experiments. "This new tool unlocks the insight contained in big data, the world's biomedical research output, to help understand immunological mechanisms and diseases," said Stuart Sealfon, MD, Chairman and Glickenhaus Professor, Department of Neurology, Mount Sinai Health System and co-senior author of the publication. "The goal of 'ImmuNet' is to accelerate the understanding of immune pathways and genes, ultimately leading to the development of improved treatment for diseases with an immunological component." ImmuNet enables immunology researchers without special computational training to use the statistical techniques of Bayesian data integration and machine learning algorithms to "interrogate" this huge compendium of public data. Bayesian analysis is able to detect relevant information in a sea of often conflicting data obtained from diverse experiments. This form of analysis selects only the datasets that provide new insight about a pathway of interest while excluding datasets that are not relevant to the targeted pathway. A goal of the online tool is to advance the understanding of the immune system, the network of cells and organs that protects the body against infections and cancer. While the immunity protects against infection, immune cells may also target the body's own cells to cause inflammation as part of many diseases where the mechanisms are not yet known. 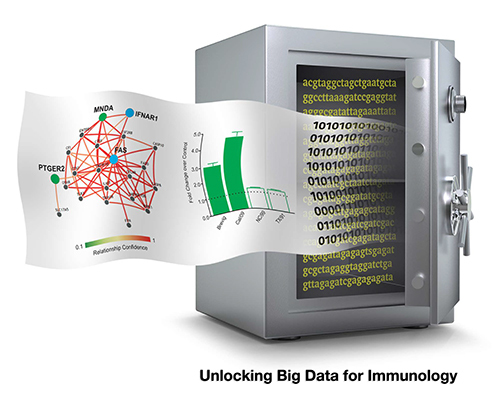 "We expect the applicability of ImmuNet to wide ranging areas of immunology will grow with the incorporation of continually increasing public big data," said Olga Troyanskaya, PhD, Professor, Department of Computer Science and Lewis-Sigler Institute of Integrative Genomics, Princeton University and Deputy Director of Genomics, Simons Center for Data Analysis, co-senior author of the publication. "By enabling immune researchers from diverse backgrounds to leverage these valuable and heterogeneous data collections, ImmuNet has the potential to accelerate discovery in immunology."